On the trail of an ancient enemy, the heroes seek more information in a merfolk city teeming with intrigue just beneath the waves. They arrive to find a group of deep merfolk claiming that the city is in the path of a destructive sea monster. But this warning is nothing more than a ruse for the campaing's villain to uncover the location to a secret Azlanti military laboratory. 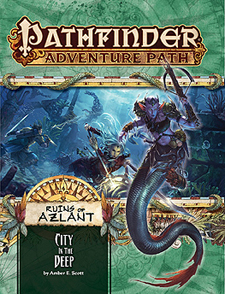 The adventurers must carefully manoeuvre the social currents of the underwater city and unravel dangerous intrigue to get to the bottom of the merfolk's plot and discover where the ancient enemy is headed so they can stop it. "City in the Deep," a Pathfinder RPG adventure for 10th-level characters, by Amber E Scott. An investigation into the reclusive elves of the Mordant Spire and a look at some of the tools they use when patrolling lost Azlant, by Mikko Kallio. A collection of dangerous monsters, by Alex Greenshields, Mark Moreland, Tim Nighengale, and Amber E Scott.